While many people go to the salon to have their hair colored, doing it at home is an economical alternative. 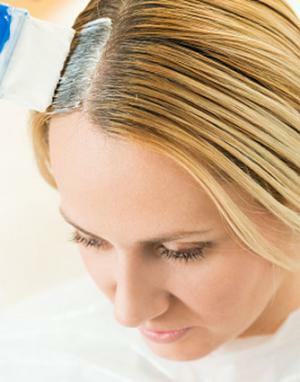 Many people worry coloring gray hair at home is messy and difficult, however, with the right products and processes you can effectively cover gray hair. Coloring your gray hair can be a challenge because when hair grows in gray, it often grows in with a coarser texture that is more resistant to color. However, with the right products and techniques, senior men and women can successfully cover the gray. Temporary color includes things like rinses, mousses, sprays, and mascara. It coats the shaft of the hair, but doesn't penetrate it, so it washes out quickly. This type of color is best for touch ups and needs to be reapplied often, sometimes even daily. Semi-permanent color will last for about four to five shampoos. Semi-permanent color doesn't have peroxide or ammonia, and it will blend gray up to about 50 percent. Semi-permanent color can deepen tone, but it can't lighten dark hair. Demi-permanent color uses a developer, so the color penetrates the hair's shaft and lasts as many as 30 shampoos. While it deposits color, it doesn't lift it, so it can only darken hair, it can't lighten it. This color will blend up to 75 percent gray. Permanent color lifts color, and deposits new color. It is effective for hair that is fully gray. Because it uses a bleach to lift color before depositing it, permanent color does dry and damage hair more than other products. Permanent color may fade, but it remains in the hair and grows out. Highlights use bleach to lift color, then color is deposited in lightened areas. This may be an effective option for blending small amounts of gray hair. Highlights remain in the hair and grow out. Carefully read the label of products labeled for gray hair to find out what type of hair color you are using. Go to a beauty supply store and ask the salesperson for the best hair color options for your type of hair and the amount of gray hair you have. Color selection is also an important step in getting the results you want. If you only have a little gray or your hair is approaching the salt and pepper stage, pick a product that covers the gray with a color very close to your natural hair color. Because an exact match is improbable, the results of these products will be a base of your natural color, with highlights in the shade of dye you chose. If your hair has turned mostly or entirely gray, you can select from a greater variety of colors. It it is safest to stay with colors near your own color and to select shades slightly lighter than your own color. If you want more radical results, consider consulting a professional hair colorist. Nothing screams "hair dye" more loudly than a color noticeably darker than your original color. As you age, your hair and skin fade. Dark hair color creates contrast with pale skin and makes wrinkles and flaws more noticeable. As you continue to age, you'll want to gradually lighten your hair color further. Before coloring your hair, read the instructions that come with the product to ensure you understand the process. Follow the instructions exactly to ensure best results. Dip a cotton swab in the unmixed colorant, and swab a small patch behind your ear. Allow it to dry and reapply two more times. Leave the area without washing it for 48 hours. If you have any reaction, don't use the hair color. Clip a small section of hair from the back of your hairline underneath the upper layer of hair. Tape or tie the hair together. Mix a small amount of colorant and developer. Brush it on your hair. Set the hair on a paper towel to process for the recommended amount of time. After the required time, wipe a small amount of the hair dye away to see if color has been deposited. Rinse and dry hair to ensure the color is what you want. Once you've determined that you aren't allergic to the product and that you will achieve the results you want, protect everything in your environment from the staining properties of the hair dye. Clip a towel around your shoulders, or wear a shirt you don't care about. Wear rubber gloves when handling the dye. Use petroleum jelly on the skin all around your hairline. Put down towels or other cloths you don't care about to protect your sink and countertops as you apply the gel. Find a comfortable place to rest while the hair dye processes where you won't drip on surfaces or stain furniture. Use a shower cap to cover hair while it processes. Allure recommends washing hair the night before coloring so it's not too clean or too dirty. The oils in unwashed hair can protect your scalp and skin, but hair that is too dirty may interfere with color. Because gray hair can be a little color resistant, Hair Color to Go recommends leaving the product in for the full amount of time recommended in the directions. Likewise, Allure recommends covering hair with a plastic cap, which can help the color penetrate the hair shaft better. You can check to see how well the hair color is depositing by using a towel or cotton swab to remove the color from a small shaft of hair. If it hasn't deposited, leave it on longer. Using warm water and wearing gloves, rinse hair until the water runs clear. Once the water runs clear, it is safe to remove your gloves. Shampoo normally after the water runs clear. Consider using a color preserving shampoo. Because some hair dyes can damage hair, it's important that you condition your hair. Apply a conditioner every time you shampoo, and deep condition once or twice per week to keep it healthy. Use the same product and color you chose before. Follow the steps above, but apply color only at the roots along the top, sides, and back of your head. Be sure to touch up roots that grow underneath the visible hairline, as well. You can shop at your neighborhood drugstore, a beauty supply shop, or at a department store like Target or Walmart for a wide variety of hair coloring products. Be sure to read the labels carefully so that you know what to expect from the products you buy. Many online sources specialize in hair care products, such as Hair Products. Manufacturers of hair color products, such as l'Oreal, have information on using their products to color gray hair.